I am pleased to introduce you to our latest collection of reviews and informative notes relating to the history of German and European religious history in late-modern history. As we launch the 25th volume of Contemporary Church History Quarterly, the journal remains an important forum for the dissemination of information and commentary on this important history. The issues and events our editors and guest contributors write about remain relevant in our current age of turmoil over identity, exclusion, and the role of religion in politics and society. 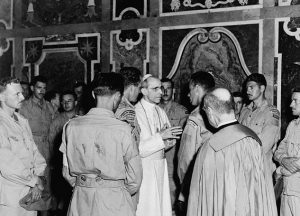 Members of the Canadian Royal 22e Regiment, in audience with Pope Pius XII, following the 1944 Liberation of Rome. Source: Wikimedia Commons. It will no doubt be some years before we learn whether or not access to a fuller archival record of Pius’ pontificate resolves the deeply divided views about his response (or non-response) to the Holocaust. In the meantime, we have a variety of new book reviews, article notes, and other news for you. Leading off is Robert P. Ericksen’s review of Matthew Hockenos’s important new biography of one of the most important figures in the “German Church Struggle” and postwar German Protestantism, Pastor Martin Niemöller. Other reviews move forward and backward in time: Andrew Chandler assesses Roger Newell’s investigation of and reflection on the role of Protestants in Leipzig’s Nikolaikirche in the 1989 Revolution, while Kevin Spicer considers Jeffrey T. Zalar’s study of Roman Catholic lay reading habits in nineteenth-century Germany and Kyle Jantzen reviews Beth A. Griech-Polelle’s new introductory textbook on antisemitism and the Holocaust. Other contributions touch on a variety of topics. Victoria J. Barnett considers two articles on twentieth-centuries challenges to the notion of “Christian civilization” in Europe, then tackles another on the role of nationalism in the thinking of Protestant theologians Paul Althaus and Dietrich Bonhoeffer. Beth A. Griech-Polelle unpacks Thomas Brodie’s recent article on German Catholics in the Second World War. Alongside these article notes, we offer a translated excerpt from Manfred Gailus’s new book on the outspoken Reformed theologian Helmut Hesse, who died in Dachau in 1943 on account of his opposition to Jewish persecution. Finally, Rebecca Carter-Chand reports on the recent 49th Annual Scholars’ Conference on the Holocaust and the Churches, held in early March at the Ackerman Center for Holocaust Studies at the University of Texas at Dallas. We wish you the best as you read this latest issue of Contemporary Church History Quarterly, and look forward to bringing you more articles, reviews, and notes in June.